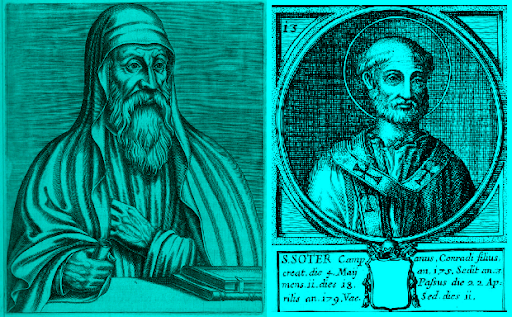 ST. SOTER was raised to the papacy upon the death of St. Anicetus, in 173. By the sweetness of his discourses he comforted all persons with the tenderness of a father, and assisted the indigent with liberal alms, especially those who suffered for the faith. He liberally extended his charities, according to the custom of his predecessors, to remote churches, particularly to that of Corinth, to which he addressed an excellent letter, as St. Dionysius of Corinth testifies in his letter of thanks, who adds that his letter was found worthy to be read for their edification on Sundays at their assemblies to celebrate the divine mysteries, together with the letter of St. Clement, pope. St. Soter vigorously opposed the heresy of Montanus, and governed the Church to the year 177. THE Emperor Severus, in the year 202, which was the tenth of his reign, raised a bloody persecution, which filled the whole empire with martyrs, but especially Egypt. The most illustrious of those who by their triumphs ennobled and edified the city of Alexandria was Leonides, father of the great Origen. He was a Christian philosopher, and excellently versed both in the profane and sacred sciences. He had seven sons, the eldest of whom was Origen, whom he brought up with abundance of care, returning God thanks for having blessed him with a son of such an excellent disposition for learning, and a very great zeal for piety. These qualifications endeared him greatly to his father, who, after his son was baptized, would come to his bedside while he was asleep, and, opening his bosom, kiss it respectfully, as being the temple of the Holy Ghost. When the persecution raged at Alexandria, under Laetus, governor of Egypt, in the tenth year of Severus, Leonides was cast into prison. Origen, who was then only seventeen years of age, burned with an incredible desire of martyrdom, and sought every opportunity of meeting with it. But his mother conjured him not to forsake her, and his ardor being redoubled at the sight of his father's chains, she was forced to lock up all his clothes to oblige him to stay at home. So, not being able to do any more, he wrote a letter to his father in very moving terms, strongly exhorting him to look on the crown that was offered him with courage and joy, adding this clause, "Take heed, sir. that for our sakes you do not change your mind." Leonides was accordingly beheaded for the faith in 202. His estates and goods being all confiscated, and seized for the emperor's use, his widow was left with seven children to maintain in the poorest condition imaginable; but Divine Providence was both her comfort and support.